432 pages | 3 B/W Illus. Using a commentary on the influential text, the Mañjuśrī-nāmasaṃgīti, ‘The Chanting of the Names of Mañjuśrī’, this book deals with Buddhist tantric meditation practice and its doctrinal context in early-medieval India. The commentary was written by the 8th-9th century Indian tantric scholar Vilāsavajra, and the book contains a translation of the first five chapters. The translation is extensively annotated, and accompanied by introductions as well as a critical edition of the Sanskrit text based on eight Sanskrit manuscripts and two blockprint editions of the commentary’s Tibetan translation. The commentary interprets its root text within an elaborate framework of tantric visualisation and meditation that is based on an expanded form of the Buddhist Yoga Tantra mandala, the Vajradhātu-maṇḍala. At its heart is the figure of Mañjuśrī, no longer the familiar bodhisattva of wisdom, but now the embodiment of the awakened non-dual gnosis that underlies all Buddhas as well their activity in the cosmos. 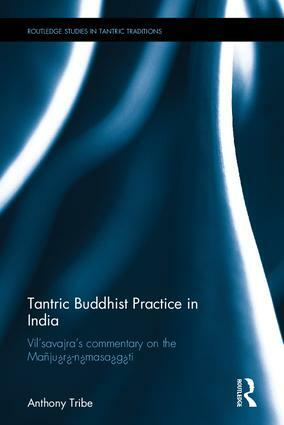 The book contributes to our understanding of the history of Indian tantric Buddhism in a period of significant change and innovation. With its extensively annotated translation and lengthy introductions the book is designed to appeal not only to professional scholars and research students but also to contemporary Buddhists. Appendix 6. Sakurai’s (1988) edition of NMAA 3–4. Anthony Tribe is an independent scholar with a research specialization in the history and development of tantric Buddhism in India. He is the co-author of Buddhist Thought: A Complete Introduction to the Indian Tradition (2012), also published by Routledge.